Book Launch Coming Soon..Pre-orders are open! We are one step closer! I have been working diligently to make this long awaited release a reality! 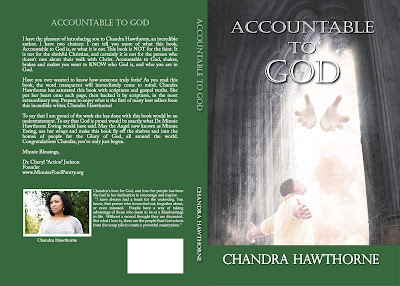 We are ramping up for marketing, and I am patiently awaiting my first proof copy of Accountable to God. Wow God, thank you! This book is so special to me, because I can remember the moment God carved the contents of it into my heart.. many years ago! The Lord's mission concerning Accountable to God would not leave my spirit and it stayed very heavy on my heart. God wants you to know who He truly is, and how He operates for you and through you. He wants you to know who you are in Him, and why He has placed so much stock in you! "Dear Lord, I thank you for not giving up on me and continuing to fuel me with the words that fill each and every page of this book". The Lord has given me such a burden for this truth. As you experience Accountable to God, I know you will be excited, relieved, enlightened, and empowered in the faith like you never have before. Please don't miss what God has revealed concerning YOU in this book. We are now accepting Pre-orders for Accountable to God. Please follow and subscribe to this blog as I plan to be very active here as we draw closer to Christ Jesus and excel in spiritual maturity. I'm telling you, when we get this stuff, we will be unbreakable!